August Bank Holiday is almost amongst us and that means Notting Hill Carnival is here. With the hostile environment that has continued to fuel anti-immigrant rhetoric, Grenfell, the Windrush Generation crisis, and the rise in racialised hate crimes it is more significant than ever. Carnival embodies, celebrates and highlights the positive impact the diversity and multiculturalism has made. 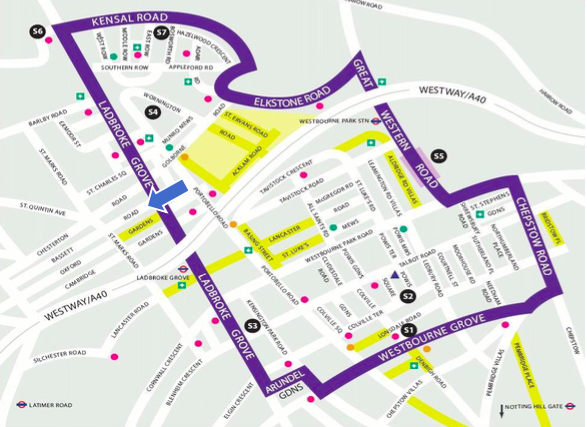 Notting Hill Carnival runs over August Bank Holiday Weekend, from Sunday 26th to Monday 27th. • On both days we will load in behind the Smokey Joe Roadshow truck on the route at Ladbroke Grove Our truck will be entering the route approximately 8am am via Bassett road W10 6JJ We will be meeting at 9:00am on Ladbroke Grove W10 6HF (see map below) and the procession will start at midday, If you cannot find us WhatsApp Onike on 07984 894 795 or Lois on 07947558707 and we will provide you with our location. The nearest stations are Ladbroke Grove and Latimer Road. • We will dance and walk our way through the route until the event finishes approximately around 7pm, so it’s important that you are fit and in good health to participate as they’re long days. You can join us along the route if you can’t meet us at the beginning or leave of you become too tired. • Be aware of your surroundings, please carry minimal baggage as there are no storage facilities on the truck, this is a security measure and will be strictly monitored. Similarly report any suspicious packages to band staff or security. • Do not climb onto the sides or the back of the truck and please do not encourage others to do so, be aware of vehicle wheels and protruding parts of the truck, keep clear of the wheels at all times especially when the truck is turning corners. • Please report any accidents, injuries or incidents to security or band leader (Onike Joseph). • Please do not take photographs, approach or interact with children and or young adults, unless they are accompanied by and have their parent or guardian’s consent. • Try not to bring valuable items on the road with you as SJR ltd is not responsible for any loss or damages incurred. AS WE DON’T WANT TO LOSE ANYBODY … IF YOU LEAVE THE BAND FOR ANY REASON, TELL OTHERS WHERE YOU ARE GOING. Sunday is t-shirt day, which will be child-friendly and more family orientated. Monday is Masquerade day, where carnival goers dress up in flamboyant costumes. This is aimed at an older crowd, so might not be suitable for young children to attend. Whilst a section of the block will need to be in costume, it is ok if you wear your LMHR t-shirt for this day again too. You’ll be able to pick up your LMHR t-shirts from outside the Panorama venue, this Saturday 25th August from 6pm onwards, Conlan Street, W10 5AW. For those of you coming out of London or if you cannot make this date you can pick up your t-shirts on the morning of the event. If you haven’t had time to pre-book book online via Eventbrite: bit.ly/2uB7L5A and are in a spontaneous mood we will also be taking cash payments on the day, so feel free to bring friends the more the merrier. If you need more information please do not hesitate to get in touch.